My name is Robyn Lessley, and I've been a Strategic Intervention and Relationship Coach for the past 5 years. AND in a moment, I'm about to share with you information that took me a lifetime to discover... and show you how to learn CRITICAL COMPONENTS about relationships and the best ways to take them from struggling to amazing all in one place! After spending years dealing with people face to face, going through training after training, and several live events, I wanted share this incredibly important information with the world. I wanted to share with you all the lessons I had to learn the hard way... AND arm you with everything you need to know to achieve a much greater and fulfilling relationship with your partner.. So, before writing this book, I initiated a massive research project and interviewed over 200 people in struggling relationships (204 to be exact) - from "I wish things were better" to "we are separated and on the verge of divorce, help me" kind of relationships - to find out exactly what information would be most valuable in a comprehensive "how-to" book about relationships. Fast forward to today, and thanks to the internet, the book is on Amazon kindle. Now the title may be misleading and you may think that is it only for people that are single. Well that is not the case at all. Just to be transparent, the beginning of the book does talk about dating, but all of the action steps are meant for everyone, including those in relationships. The final book, "How To Find Your Soulmate: 23 Action Steps To Make Love Last" was written in a unique way to teach you so many things need to know about relationships, and what you can do to help turn them around or even just to learn from past mistakes... explained step-by-step, and complete with a workbook so you can do the exercises. The book also contains real examples as they can happen in our everyday lives. This is the true gold that you won't find anywhere else. Info you'd otherwise maybe never discover unless you have gone through the same training, live events, and life experiences as I have - including answers to all those tough questions you can't just get by doing an internet search or heading over to your local library. And unlike most relationship books, everything is explained in plain English, without any "snobby" professional jargon. I wrote everything so "regular people like us" could easily understand it all. Get Real with what your bad habits are doing to your relationship. Never again have to wonder if you're doing something wrong. What you don't pay attention to can cause the most damage. The biggest mistake almost all of us make -- when it comes to showing our partner love, and why they don't feel it. BONUS - 6 little-known Human Needs that if met at high levels, is the best prevention for infidelity. Prevention is the Best Medicine! Learn how showing all of your flaws can be so much better than trying to be who your partner wants you to be. Giving the answers to the test. Learning to realize that instead of wanting your partner to know how you really feel and how you want them to love you, you must tell them. Getting clear on what you really want in a relationship, The MOST important things you want and don't want in a relationship. How To Identify Your Mistakes in a chance to save your relationship. Learn the most effective ways to make your partner think about you all day long. Discover if you are the out of polarity with your partner, and how to make your love life juicy again. Great action steps on how to find your perfect soulmate. It all starts with you, and then knowing what you want. I've been in some good long term relationships, but have never been able to find 'the one'. After reading this book, I have a much better idea of what to improve in myself before I can attract the right person into my life. It includes an action workbook too, which is an amazing add on to the book. It's simple and gets ideas flowing out of your head and onto paper." Education is when you read the fine print; experience is what you get when you don't.” This guide stands out in the crowd, as author explains everything from the perspective of her own experience. It’s easy to read and comprehend. Starting from the dating scenario to the day to day complex relationship issues, the author has done the homework and is successful in putting into words in a reader friendly format." This is a straight forward guide to improving your relationships and identifying the tools you need to be successful in finding, keeping, and developing a lasting relationship. It contains insight from the author's own experience and from the research she put into topics relating directly to relationships. As a quick read, this has powerful suggestions. It can also be used as a progressive guide, in association with a quality workbook, to benefit anyone. In one hour you can transform your approach to relationship building!" Robyn has done a great job outlining really easy but powerful steps to creating a lasting relationship!" So much thoughtful information laid out in practical steps. Thank you so much for writing this!" Want to check out this book for yourself? You can... without risking a penny. 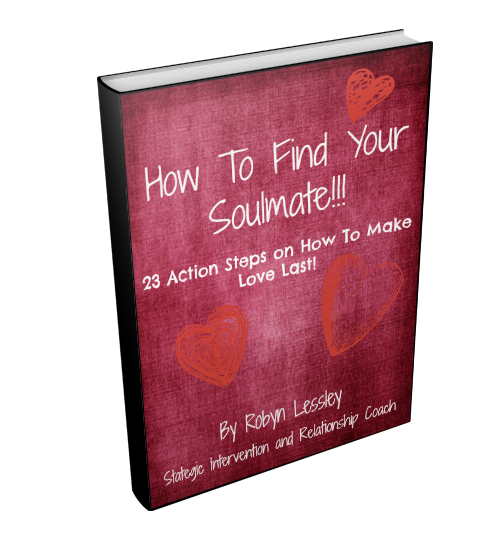 As you can see, I wrote "How To Find Your Soulmate: 23 Action Steps To Make Love Last" not only to give people a completely different perspective on relationships, but also to take it into their own hands and do something about their own situation. But...that is the problem. Most people will read the book but not do the exercises. WTH??? Why would you get a book to fix your situation but then not do what it tells you to do?? Just scroll down to the bottom of this page and JOIN ME in this mini-course by clicking on the "Join Me Now!" button. You'll be redirected to a secure order page where you'll be asked to provide your billing information. You can either use your credit card, or pay with Paypal. Now, before I even mention a price...let me make it perfectly clear how EASY this decision really is. Here's how it works: Get the mini-course. Read the pages for the day (5 days a week, I don't want anyone getting behind), Watch the short video (max 5 minutes long) of me explaining the Action Step, do the Action Step for the day (max 15 minutes), and post in the private Facebook Group, and get feedback from me. THIS IS REALLY A CHANCE TO WORK WITH ME AT A RIDICULOUSLY LOW PRICE. I really hope that you jump on this opportunity. If you are not completely thrilled with what you've learned, after 60 days (plenty of time to do all of the action steps, even if you fall behind)... then I INSIST you send me an email for a fast refund of your purchase price. No questions asked. NO hassles either. Yes, it's a financial gamble for me... But that's how confident I am that you're gonna be thrilled with this ebook and the mini-course. I poured my heart and soul into it - and gave you critical tools to help any relationship from finding a new one, to the relationships on the verge of divorce. Feel free to look me up. If you're not happy, I'm not happy. So when you order today... you essentially get to see and try out everything for free if you choose. You do NOT even have to give me a reason if you decide to get a refund. I will trust you to do the right thing, as I have trusted people over my entire career. I want to make sure that I can give the best feedback to the people in the mini-course. So I don't want to keep enrolling people and lower the value. Once the course is full, you can get on a waiting list for the next mini-course. So don't delay. Sign up today, while it's on your mind and before this opportunity vanishes. To order your copy of the ebook and the mini-course today, Simply click on the "Order Now" button below. You'll be redirected to a safe & secure online order page. Once you complete & submit your order, your ebook and workbook will be emailed to you the same day! The Mini-Course starts on Dec. 1. P.S. I only have room for a limited amount of people in each mini-course. And the way they typically move, I can't tell for sure if I'll sell out this week or next... but it will fill up fast. So don't miss out on your chance to get in on this mini-course starting on Dec. 1, 2016. P.P.S. And Remember -- when you order right now, you DO NOT RISK A SINGLE PENNY because you're completely protected by a 60 Day 100% Money Back Guarantee. If you decide to that you were not completely happy with what you learned and experienced, just email me for a fast refund. No hard feelings. That's how confident I am that you're gonna love this ebook and mini-course. And I think you're gonna flip over the info you discover.